Pam is an executive coach and accomplished global HR leader. Over the course of her 20-year diverse career, Pam has leveraged her results-oriented style to help individual leaders and global organizations across multiple industries to grow and manage change. Pam’s broad and deep corporate HR background has informed and enhanced her ability to improve individual leadership skills and talents. Her expertise has helped companies align their people to their business objectives, and includes strategic planning; talent acquisition and management; succession planning; organizational assessment and design; change management; and acquisition integration. As a senior consultant with the telos institute, she focuses on bringing out the best in people – uncovering their unique strengths, maximizing their potential and advancing their impact. Her corporate executive experience includes being the Director, Organizational Development and Internal Communications at Lincoln Electric where she lead global talent management and development processes as well as built their communications platform to facilitate engagement. Pam also spent time as the Global Vice President for the Packaging Coatings Division at AkzoNobel where she successfully led global realignment which improved customer satisfaction, increased sales and profitability, and streamlined new product development. 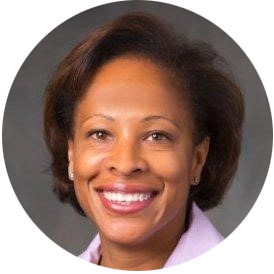 And as Senior Vice President, Performance, Talent and Succession at PNC (formerly National City Bank) she led the development and integration of a performance and talent management philosophy and process, which provided timely and relevant feedback to over 30,000 employees, increased performance accountability and implemented best practices. Pamela earned a B.A. in Economics from Howard University in Washington, D.C., and has completed various leadership and human resources studies at Case Western Reserve University in Cleveland, OH, and Carnegie Mellon Executive Women’s Leadership. Her extensive community involvement includes serving as Chairperson of Trustees for the Great Lakes Theater Festival, and Allocations Chairperson for Rainbow Babies and Children’s Hospital Foundation Board in Cleveland, OH. Pamela and her husband Macke live in Solon with their two children, EMack and Noël. Pam enjoys watching her kids play hockey and soccer. Otherwise you will find her biking, hiking, skiing and traveling with her family.